The history of the Halberstadt Landwurst GmbH commenced on 22 July, 1958 with the merger of 21 butchery businesses to form a single producers’ cooperative, initially comprising 42 employees. On 28 July, 1958, the new PGH Harzland started production at five different sites amid what were, at times, very tough conditions. In the following years, this sparked efforts to find a way of establishing the business in a more central and effective way and simultaneously enhance the quality of the goods produced. Following protracted negotiations, these efforts finally bore fruit in the form of a newly-constructed production base in the Halberstadt Spiegelstrasse, although business there could only get underway in May 1962. With the German reunification in the year 1990, PGH Harzland found itself undergoing further profound changes. The former PGHs from the GDR era were disbanded or regrouped to form new company structures. From the PGH Harzland, this was the first we would see of Fleischer GmbH Harzland. Then, finally on 08.11.1990, came the founding of Halberstadt Landwurst GmbH. The economic and corporate fortunes of the company would fluctuate in the subsequent period. On the one hand, there was now strong competition from the former federal states, while on the other, it became increasingly difficult to ensure the new quality and production requirements while remaining within the former production facility. Midway through the following year, the company thus decided to construct a new factory within an industrial estate that had just been established. However, this plan was later shelved in favour of a more effective yet simultaneously far cheaper approach: the transfer of Halberstadt Landwurst GmbH to the Halberstadt slaughterhouse site. After the enlargement and conversion of the existing production facilities there for a sum that amounted at the time to around 3 m DM, Landwurst GmbH relocated as planned in mid-1996 and were henceforth able to meet all modern production requirements from the new location. The obtaining of the EU certification for dissection and sausage production in 1996 reflected this new development and at the same time, guaranteed that the company could progress to supply the major retail chains and thus establish an excellent starting point for the future. From 1999 to 2006, the Halberstadt Landwurst GmbH continually achieved positive results, thus ensuring a stable business footing, which was also seen as the foundation for further development. Up to this time however, although the company boasted a modern sausage production facility, which was competitive in all areas, there was still a lack of both upstream and downstream integration and diversification stages, with the company continually 100% depending on external raw material suppliers and equally reliant on external marketing to major and individual customers. With the purchase of company shares (90%) in the pig-fattening business SMA-Meister GmbH, a major step on the path to independence had been taken. The ultimate goal was to ensure that the vast majority of raw materials required for the sausage production could be obtained via these suppliers, balance out market fluctuations and ensure enhanced transparency in terms of the traceability of the processed goods. An equally important measure, as part of the vertical integration plans, came when the Halberstadt GmbH took over the slaughtering process itself. With the existing 62 slaughterhouse employees, March 2007 marked the start of the in-house slaughtering by the rural sausage company. The use of the portion of fixed assets required was ensured through long-term rental agreements and leases or partial sales. In the meantime, the monthly slaughtering capacity was increased from around 8,000 pigs per month to around 11,000. Likewise, the company did not sit back when it came to sales either. Alongside successful product sales to major retailers and butcher’s shops, from September 2006, a marketing body was established, which currently incorporates 15 sales outlets and 5 mobile sales facilities, as well as the speciality restaurant “SVEJK”. The pigs received from the in-house fattening facility, farm cooperatives, small farms and cattle breeders in the region are slaughtered and subsequently transferred to the refrigerated facility. 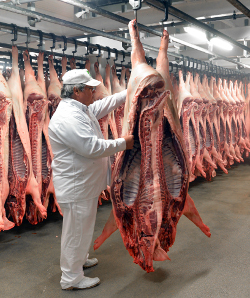 The slaughter capacity is around 85-90 individual pigs per hour. Monthly, depending on the market demand, between 8,000 and 12,000 pigs are slaughtered. This results in the production of around 900,000 kg meat and ancillary products. Around 50-60% of the slaughtered pigs are cut up in the related dissection process, in line with customer orders, into portions (e.g. ham, shoulder, chop etc.). The remaining portion is sold as a complete pig carcass. Assisted by the 10 in-house refrigerated trucks and transporters, the wares produced and assembled to meet customers’ orders are delivered daily to meat establishments and smaller butcher’s shops, as well as the in-house outlets of the Halberstadt Landwurst GmbH company. Larger meat processing businesses up to 250 km from the slaughterhouse are supplied, while the majority of private butcher’s shops and the in-house network of outlets tend to be within a radius of around 90 km around Halberstadt. The Halberstadt Landwurst GmbH, a sausage producer, with a long tradition of craftsmanship. Using old and traditional regional recipes, today around 170 different sausage products and around 50 kinds of meat are produced and sold to several large retailers, the in-house outlets and various small customers. The daily production volume is around 5 tons. Among the most popular products are fried sausage, liver sausage, mini sausages and preserves in glass. Both the EU production certificate and the DLG awards are ample proof of the exceptional quality of the items on offer. As well as the external customer sales channel, the Halberstadt Landwurst GmbH company has also established internal sales channels. In addition to our Restaurant „Schwejk“, the company has incorporated 17 in-house branches as well as 5 mobile sales facilities, in which around 85 employees work.